At the turn of the new year, I wanted to experiment with a new notebook set-up for planning, journaling, and note-taking. The intended set-up had two major parts: At-Home Analog and Analog Carry. The first month of using these systems hasn't been perfect, but it has been pretty interesting. I intended to utilize four notebooks: The Slice Planner and Field Notes for my analog carry, and the Hobonichi and Moo Notebook for my At-Home Analog. 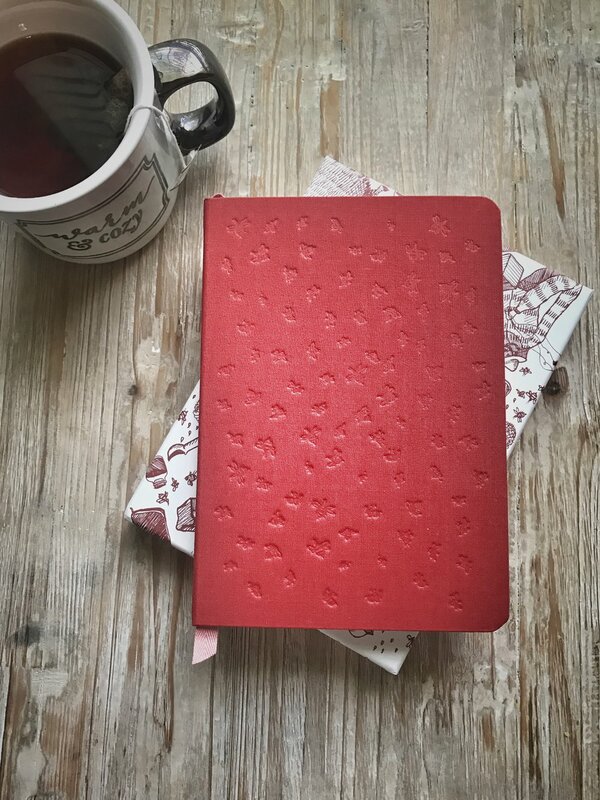 State of the Notebook: Because I carry my Field Notes primarily in a cover, my Lunacy edition doesn't have quite as much damage to the cover as it might otherwise. But make no mistake, Field Notes look even better after they have been used than they do brand new. Using the Notebook: I carry this Field Notes notebook everywhere I go. Running errands, going to dinner with friends, job interviews, weekend trips, etc. I've used it for shopping lists, jotting down random phone numbers, writing a quick note in the car. The notes in this little notebook are not pretty. The handwriting is messy and rarely stays within the lines. Some of the pages even got wet and washed some of the writing away. None of that really matters. Anything I need to write down that doesn't go in one of my other notebooks goes in here, and the beauty of that is that I always know where those random notes are. Early in the month I wasn't using the Field Notes much, but it's picked up as the month went on. Safe to say I'll continue carrying this. State of the Notebook: The softcover planner insert is holding up well. I am enjoying the paper with a variety of tools from pencils to gel pens to Mildliner markers to fountain pens. It's no Tomoe River or Rhodia, but it is very nice paper and perfect for the intended use in my opinion. The leather cover looks like it took a beating and honestly, it doesn't really bother me one bit. It looks used, and that's because it is. If anything, I wish they would have made the two ribbon bookmarks a little more fray-resistant. Using the Notebook: I utilized ten two-page spreads during the month of January. This might not seem like much, but this might have been the most effective analog tool I used all month. Currently, I spend three days a week working in a clinic. On these days, where work plus commute consumes 9-10 hours of my day, the Slice Planner seems like overkill. Working in a clinical setting doesn't always afford itself to the luxury of forward planning. You show up ready to go, and the patients dictate the day. The predictable spontaneity of that type of day is what I love about working in a clinic, but also means I don't really need to plan those days hour-by-hour. This is why I need an undated planner. I don't feel pressured to use it when I don't need it, and when I come back to it- I can pick up right where I left off. On the two days a week I am working on my PhD either on campus or from home, the Slice Planner is perfect. It allows me to sit down the night before (or sometimes the morning of) and make a visual summary of my upcoming day. This quickly shows me how much time I do or do not have to complete everything I need to tackle for that day- and that awareness helps me prioritize. The two-page spread gives me space to make to-do lists, and even take important meeting notes that are related to those to-dos. The final thing I have been utilizing the planner for is tracking/ reflecting on how my day actually goes in comparison to how I planned it. I write little notes out to the side of the visual Chronodex- items I completed, distractions that kept me from my work, and unexpected things that came up. Maybe the greatest benefit of making these notes is showing how frequently and severely I overestimate how much I can get done in one day. Things almost always take longer than I planned on them taking. Also of note, the app has not been released yet, so I haven't had a chance to try anything related to those set of features yet. State of the Notebook: Watercolors make for a few crinkly pages, and I went a little too crazy on one page and ripped it a little. It doesn't close flat the way it did when it was brand new but otherwise it's the same as it always was. My biggest #hobonichiproblem is that I'm too impatient to let the ink dry. There's at least one smear on almost every page. Using the Notebook: Not every Hobonichi day was completed on the day of the actual dated page, but most were completed +/- 48 hours of the actual date. I haven't quite settled into a habit of when and how I use this little notebook, but so far I love it. Some days it's a quote, some days a sketchnote of my day, some days swatching new art supplies, and some days a few simple sentences about my day. I would classify most days as having a "things I want to remember about this day" theme. If I didn't have much time on a particular day, I simply sketching things out in pencil and went back later when I had more time to add ink, watercolors, or colored pencils. Some days my sketches and short writing seemed a little trivial, and I haven't quite figured out what I most want to document. But, flipping back through the pages for the whole month- I'm really glad that I did them. Somehow in retrospect, they have additional meaning. State of the Notebook: This notebook looks almost the same as the day I got it because 1) I keep mostly at home in the sleeve it came in, and 2) I have only written in it six times. I say almost the same because I did spill a drink ALL over the notebook the one time I took it in the car with me. Interestingly, even though it soaked the cover and left a bit of a stain, NONE of the insides are damaged in any way. I don't know if this is a particularly water-resistant notebook, or if that was extremely good luck, but I love this notebook way too much to try that experiment again. Using the Notebook: Wah-Wah. This one didn't quite pan out, and that is mostly due to the fact that I really want to utilize this writing time first thing in the morning. This just in: I'm still not a morning person. But, I can say that the days I did take the time- there is no doubt in my mind the writing was good for me. It's still something I want to incorporate more. Even writing 20% of mornings is better than any month last year. Here's to baby steps. The second part of my analog set-up for 2017 includes the tools I want to start utilizing more at home. While my daily carry analog tools are about planning, capturing, and ultimately getting things done- my at-home set-up has a different (yet related) purpose. If there's one thing I need more of in my life, it might be this one. A busy schedule has a way of crowding out opportunities to think about you're what you're actually doing when you're running around being busy. And without this reflection time, no matter how "productive" your days may be, they have a tendency of drifting away from the truly meaningful things in life. The one habit I've always wanted to make a priority is writing every day. I have heard it said that habits should either be meant to make your life better in the now, or better in the future. For me, writing is certainly both. Putting words onto paper has always been healing, clarifying, and energizing for me. Even ten minutes of writing things down can put me in a different state of mind. But writing is also building for the future. In my scientific day job, my current degree program, and every creative aspiration I have- becoming a better writer is a significant piece of the path forward. The idea of "morning pages" has always inspired me. This writing practice is meant to be stream-of-consciousness type writing that is completed first thing each morning. Utilizing the fresh start of the morning to put your ideas and feelings on the page before they are consumed in the overwhelming information water hose that is the internet and social media. This practice is also every bit as intimidating as it inspiring. First, and most importantly, I am completely and utterly the opposite of a morning person. The morning is my nemesis. I usually wake up with just less than enough time to find clothes, throw my hair up, and get out the door. Never once in my life have a succeeded at any morning routine for a meaningful length of time, no matter how many amazing articles I read about the life-changing magic of not hitting snooze. Secondly, sometimes the blank page still scares me. So, it may not be an everyday thing at first, and it may not be three pages. But my goal is still to use analog to create a regular, simple morning routine for myself. I'm starting small. Really small. The kind of small that still seems semi-doable to a professional night owl. Five minutes of writing each morning. And to jumpstart this practice in 2017, I'm utilizing a brand spanking new notebook I received for Christmas. Thanks to Well-Appointed Desk for the recommendation. Meet the MOO notebook. I will have to update my thoughts as I use this notebook more, but if first impressions mean anything, this one hits it out of the park. The design is straightforward and beautiful. When they say this notebook lays flat, they mean it. It's just about the perfect size to be substantial but also portable, and the paper is excellent. It any stationery product is going to inspire me to get up a little earlier in the morning, it might be this one. That's a darn good paper product people. The final tool I plan to use is a tiny little notebook with an insane number of pages of world-shatteringly good paper. Stationery addicts, you know the one. The Hobonichi. If you have never heard of it, you should go immediately to Instagram and search #hobonichi. While the MOO notebook makes me want to curl up with my favorite pen to write the humble beginnings of a New-York Times best seller, the Hobonichi makes me want to grab every ink and art supply I own and just play. Create something. Create anything. While its original purpose was meant to be a planner, I plan to use it as a place for visual and artistic reflections of my year. It has a small (a.k.a. not intimidating) page for each day, perfect for a sketchnote, quote, or small sketch. While the MOO takes the ambitious morning routine spot, the Hobonichi makes it into the more reasonable evening routine line up. Turns out, an evening routine might be just as important as a morning one! A four notebook set-up for the year might seem a little complex. I won't argue with that. That's why I'm calling these practices experiments and not necessarily resolutions. I'm trying this out to see how it goes, and I more than expect this set-up to change and evolve as the days go by.